Lock in a great price for Argonaftes – rated 9.5 by recent guests! Efi is absolutely wonderful! It's a very small family owned Villa, but I couldn't have asked for a better accommodation! 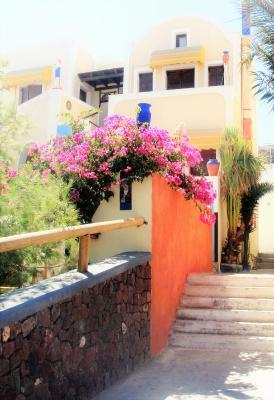 It's a very short walk from the city center of Fira and has a ATV rental right next door. 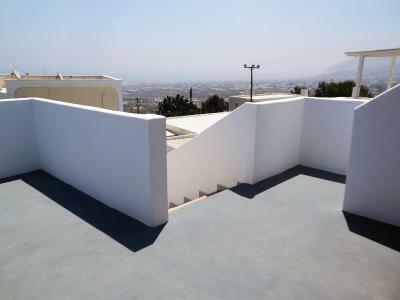 All main sights outside of Fira are only a 20-30 minute drive away. I would highly recommend staying at Argonaftes! I will definitely be back! Everything. The host Efi and her family were soooooo nice and helpful. The room was super clean with everything you needed and I loved the little balcony. Walking distance (600m?) to bus stop and got cheap and nice restaurants and mini mart nearby. It was a very good experience staying here. Efi, the charming, gracious proprietor of Argonaftes Villas, was a delight. She went above and beyond to make sure we were comfortable, offer suggestions, and make our stay wonderful. 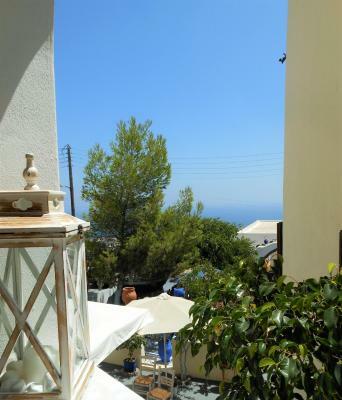 Argonaftes is in a wonderful location, just a short walk from Fira or Imerovigli. If we go back to Santorini, we will definitely stay there again. Argonaftes hotel exceeded my expectations. I was traveling with my mom and brother and we stayed for 4 nights. We were very comfortable at the hotel and felt very safe. Efi was extremely helpful, friendly and kind and the rest of the staff was equally friendly and helpful. 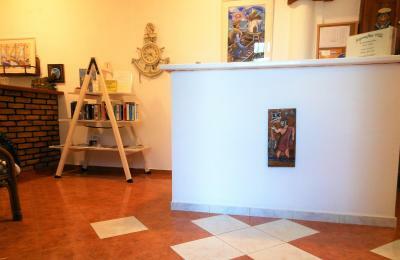 We stayed at a triple room which had plenty of space, it had everything we needed and we were very comfortable. 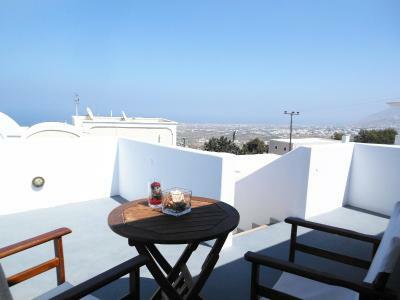 The hotel is very near Fira town,within a few minutes of walking distance. 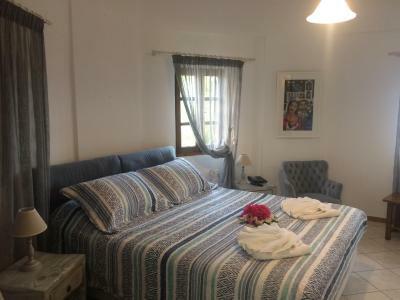 It is very quiet at night and the room is very clean. During our checkout Efi helped us solve a problem we had with our flight bookings and thanks to her help we were able to get to our flight with no trouble. 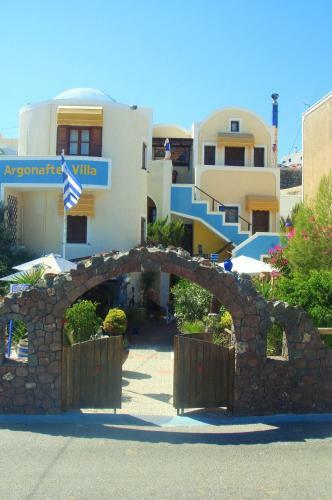 I have travelled to more than 20 countries and as a result have stayed in many hotels/hostels/ b&bs and in my experience the staff at argonaftes has been one of the best. 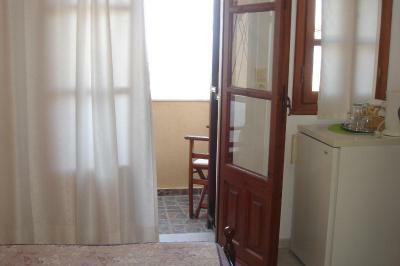 Good location, tucked a bit away from the main Town square but still easy to get to. Good balcony view, not the best but the price reflects that. Our stay in Argonaftes was very pleasant, we felt ourselves very comfortable in there, they helped us giving all the information we needed to go around the island, and were all very kind. The room was clean, and the location was great. We would definitely come again. The staff was super friendly. Explained all about the island. Love the hotel and the location. Great location about 200 meters from shops and restaurants - it was nice not being in the town center because it was quiet at night. 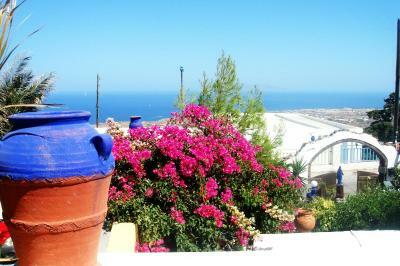 Efi was wonderfully accommodating and gave us tips on what to see and where to go while in Santorini. 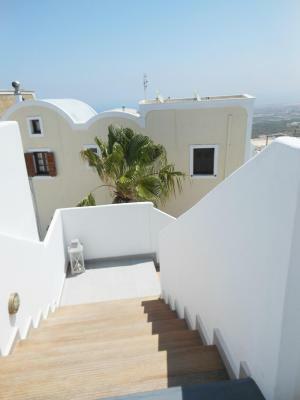 Located in the scenic town of Fira, the adult-only Argonaftes villa offers traditional Cycladic-style units, some facing east with a sea-view balcony. Breakfast is served on the terrace surrounded by colorful flowers. 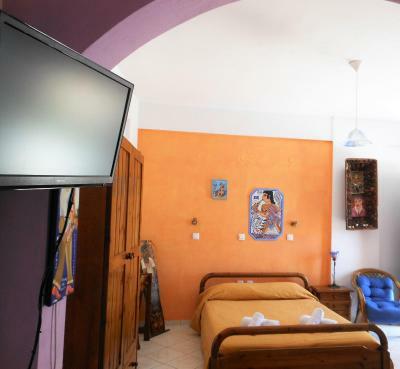 Rooms and apartments at Argonaftes are decorated with paintings made by the owner. 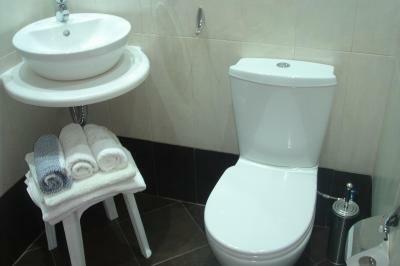 Each air-conditioned unit is equipped with a TV, mini fridge and hairdryer. Some also include a kitchenette with dining area. Some units are located in a windmill like tower. Near Argonaftes, there is a bus stop connecting to the charming village of Oia. 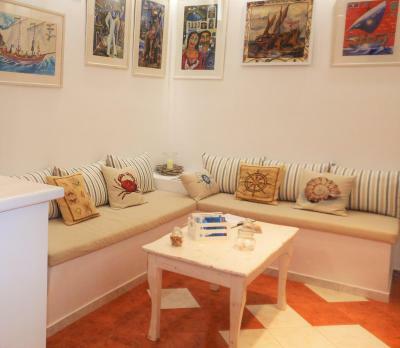 Fira center is just 1,950 feet away, and provides a wide choice of restaurants, shops and night clubs. Shuttle service can be arranged provided by the property upon charge, while free parking is available near the premises. WiFi is offered throughout. 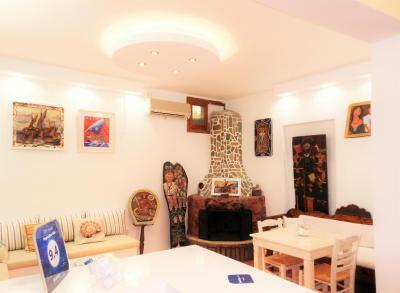 뀐 Located in the top-rated area in Firostefani, this property has an excellent location score of 9.4! 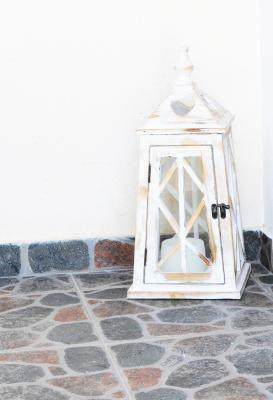 When would you like to stay at Argonaftes? -free toiletries and a hairdryer. 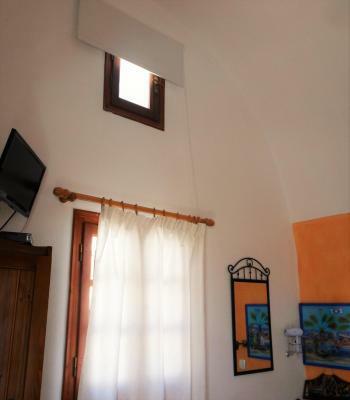 Spacious room on the first floor of a traditional windmill-style structure. It offers garden views from its windows. 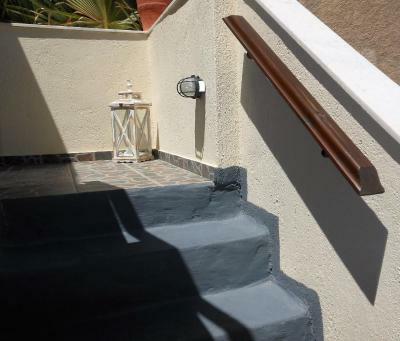 It has access to a communal patio and garden. Room offers a private balcony with views of the island and the sea. Please note that the bedding setup is upon availability. 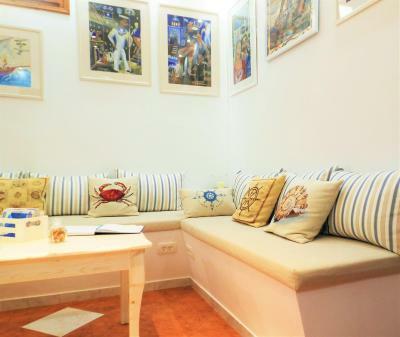 Offering a sea view, this air-conditioned room opens to a balcony. It has a flat-screen, satellite TV and a mini fridge. Free toiletries and a hairdryer are included. Free Wi-Fi is provided. Our property, rooms and balconies have no view toward the volcano, the caldera cliff and the sunset, which are landmarks located at the west side of the island.The sea, where our rooms have view to, is not located right below our property but rather it is at a distance of about 3 kilometres. 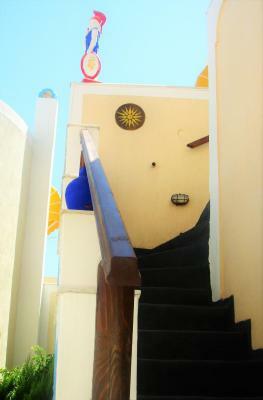 This means that our balconies have a slopping-down view that includes a good part of Santorini's east side. House Rules Argonaftes takes special requests – add in the next step! Argonaftes accepts these cards and reserves the right to temporarily hold an amount prior to arrival. Kindly note that check-in is possible until 16:00. Kindly note that people under 21 years old cannot be accommodated. Please inform Argonaftes of your expected arrival time in advance. You can use the Special Requests box when booking, or contact the property directly using the contact details in your confirmation. The bathroom was a bit small, but it wasn't crucial. 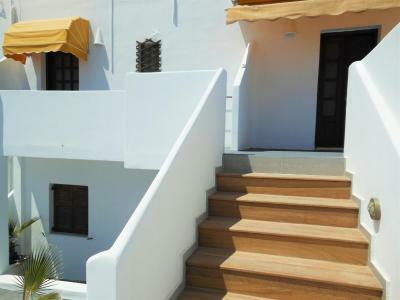 Managed by extremely hospitable and friendly family, located a few steps away from the main road in a walking distance from Fira and just a couple of minutes from Firostefani's great views, it was an island of relief and tranquility on a highly touristy Santorini! Got loads of info and tips about the island and options to spend our days there. 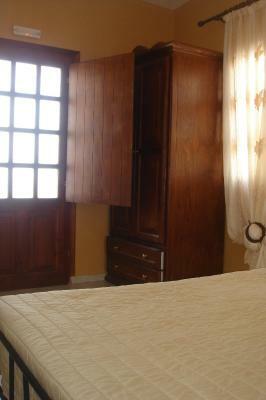 Spacious triple with a kitchenette and a balcony could easily accommodate four persons. Excellent! We will go back! The staff were so lovely and helpful, giving us lots of local tips. We liked the location, only a few minutes walk to get some amazing views over the caldera. There are no views over the caldera from the property, but our room had great views over the opposite side of the island. The bus station was only 10 mins walk away to catch the bus to Oia, and maybe 5 minutes walk to Fira where there were lots of shops to explore. Our room was clean and had everything we needed. Overall it was good value for money compared to a lot of places in the area. We were extremely happy with our stay. Staff were very welcoming and helpful. 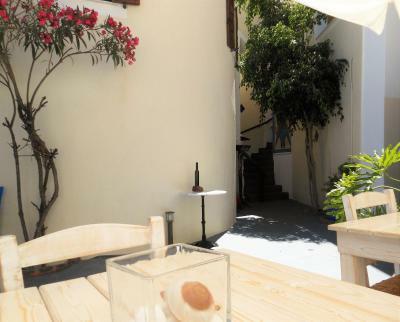 The location is perfect for exploring Fira and easy to get to other parts of Santorini. Would highly recommend. Very nice and helpful hosts,so friendly, wie felt very welcomed. Absolutely recommend the Palace. Efi is incredibly hospitable. She did everything to make our trip enjoyable and gave us all the information we needed to do the things we wanted to in Santorini. Family owned hotel. They work so hard to meet guests' expectations. So kind and welcoming to all guests. Great location to the center and transportation. I will definitely stay this hotel when I visit Santrini. Excellent location. Only 10 minute walk in to Fira centre where all the restaurants, shops, bus station were. Efi went the extra mile to help us sort out airline tickets, booking shuttle bus to airport, tips and advice on where to eat and what to do. We really appreciated her help and even though she was really busy she took the time to help us. Thank you Efi. The room was great. Nice little balcony, comfy bed, very clean. Great location and perfect host! Efi was so welcoming and friendly, giving us lots of information on how to get around the city and where to go. 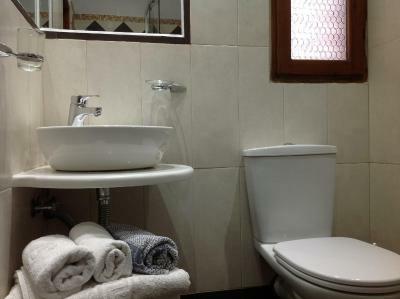 Our room was very spacious and clean, we would definitely recommend! Efi is fantastic host. She was more than helpful before and during our stay. The location is also fantastic. 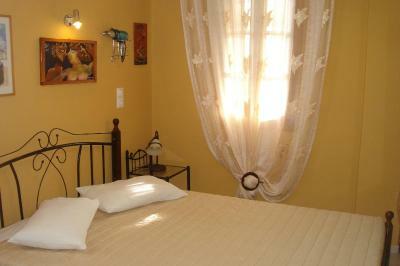 Rooms are clean and comfortable with balconies facing the sea and the Three bells. Be back. Such a great customer service! Above and beyond expectations! Extremely lovely and helpful people! The place is very clean and full of local arts what is cool!!! Great value for money!!! Only a few small things that should not really matter: 1. the shower area is a bit small and if you open the window while showering your head may hit it. 2. As mentioned in the positive side it is lovely to open the window in the main room but then privacy could be compromised as there are buildings around with balconies that people can look into your room. But again you just need to close the window temporarily when getting changed. Location is nice, only 10 minutes north of the centre of Fira and if you travel back from your excursion to Oia you just need to stop at Firostefani bus stop and it's a 2 minutes walk back to your room. A separate room upstairs was where we stayed. If you open the windows then the breeze is very cool and relaxing. We did not have to use the Aircon at all even when the outside temperature was 30 degrees. 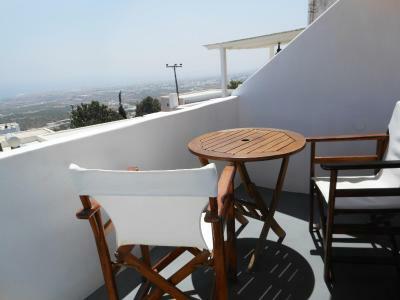 The balcony looks to the East and if you can wake up a bit early then a marvellous sunrise view is there for you everyday. Last but not least, the host is lovely, friendly and very helpful with loads of info. It is also a house of an artist. I was given a painting as a parting gift and I really like it. 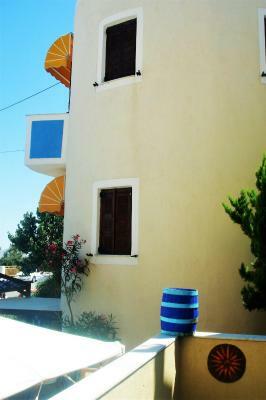 Also many thanks for recommending the taverna Simos. 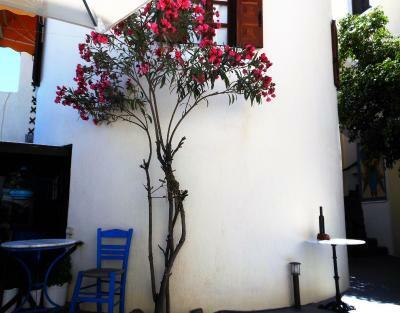 It is the best restaurant / taverna in all of Greece (we had tried about 10). 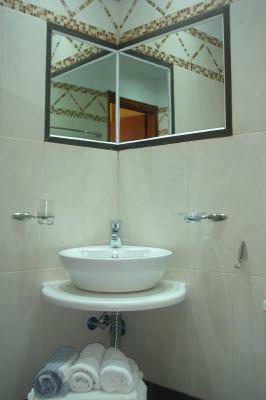 Great location, wonderful and very clean hotel. Great staff always willing to go the extra mile to help you. Efi and her family are a true bless! Slats under the mattress were cut too short and the bed collapsed about 2.AM. Need a box spring unde5r mattress. Other than that everything was great.